Celebrating This Important Band Via Its Authors. The organisers of the acclaimed Modernist, Punk and The Who literary events 'Streets We Ran' return to celebrate one of the world's most influential and important bands through its writers. 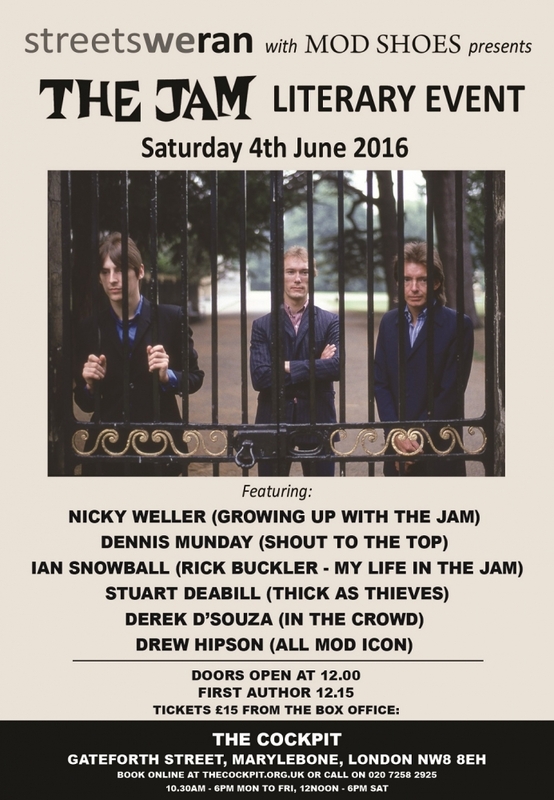 Each author will discuss the effect The Jam had on them and what inspired them to write about them. The carefully selected writers will also share unheard stories of working with Paul, Bruce and Rick at different points of their lives. There will also be a Q&A with the audience at the end of each discussion. The intimate fast paced show is a unique look on what makes the Woking 3-piece still important to so many people 33 years after they split. There will be copies of the authors publications and memorabilia on sale and the sponsors 'Mod Shoes' will be selling their high quality footwear in the foyer on the day.